To find an old way of saving that is new again, head to the line of mortuaries along Los Angeles’ Washington Boulevard, between Hoover Street and the 110 Freeway. One of those mortuaries has been converted to a union hall for the Service Employees International Union—United Service Workers West. Inside the union hall and behind the big room used for banquets is a library named for Edward Tchakalian, an Armenian-American labor activist who uncovered a statewide scheme of paying janitors sub-minimum wages for long hours of work within the Ralphs, Albertsons, and Vons/Safeway grocery chains. When I visited the hall recently, I met Juan Estrada, a shy man who’s worked as a janitor in Universal City for 18 years. He and six of his coworkers participate in what’s called a cundina. It is a lending circle, and a method to build savings. A cundina, also known as a tanda, which translates roughly to “taking a turn” or “doing a circle,” is a worldwide phenomena for poor people whose access to capital is limited. In Korean it is called kye, susu in West Africa and the Caribbean, juntas in Peru, and hui in China. There are many variations of cundinas, but the easiest way to do it is to pool your resources. Typically each cundina takes contributions from at least six and as many as 12 people. Each participant contributes a certain amount monthly, from $50 to $200 or so. Then, you draw a number from 1 to 12. You receive the whole pot for the month that corresponds to the number you drew. Estrada told me that he participated in a cundina back home in Guatemala. But this cundina was different for two reasons. First, it was established through Building Skills Partnership, a partnership between building owners, employers, and the union. And second, it’s connected with a bank called Mission Asset Fund. The bank reports the savings of the cundina members to credit agencies and allows the participants to build credit. (The participants also attend a credit class and learn about their credit histories). And the bank arranges things so that the cundina contributions and disbursements are automatically drawn and maintained through each of their bank accounts. As a modern updating of an old tradition, the cundina epitomizes the union hall where it operates. “Union hall” may sound archaic, like a place where men in coveralls sit around and wait for their number to be called before heading to Walgreens for a malt. But SEIU-United Services Workers West is a different sort of union. It’s relatively young, forged by janitors who organized in L.A. office buildings in the 1980s and ‘90s. Today, its members are 40,000 security officers, janitors, and airport workers across the state. For this union, serving members means offering classes and training that allows them to build skills and gain power. I’ve been spending time in union halls since I was a teenager who, having grown up in L.A.’s foster care system, was trying to find a voice and do something different. I’ve worked for unions, and even drove around the country visiting union halls. But I hadn’t encountered a union hall with programming quite like this. Members of the cundina. 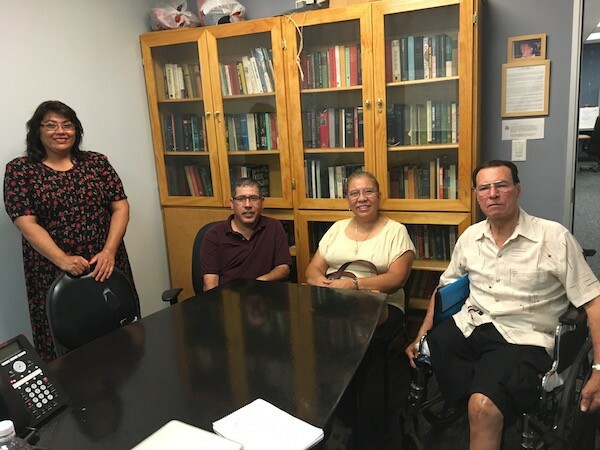 From left to right: Dolores Santa Maria, Juan Estrada, Ana Velasquez, and Nynor Galindo. 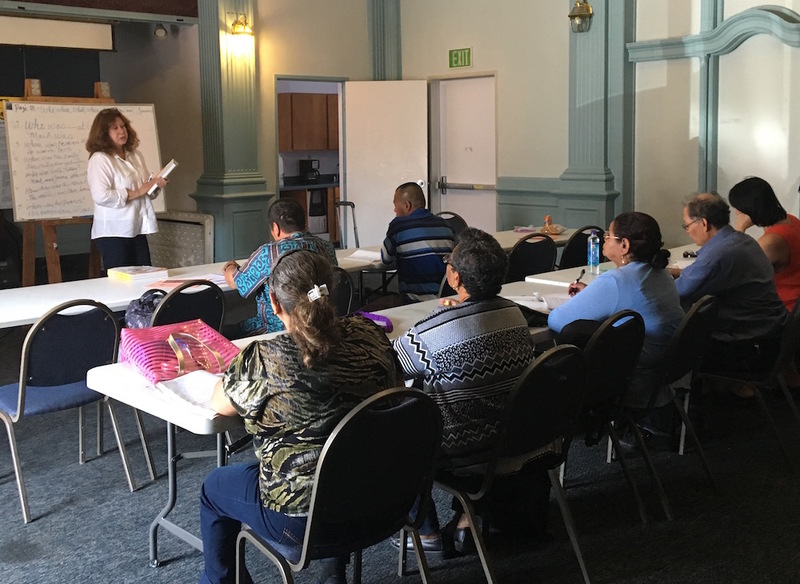 On the day I visited the union hall, a group of janitors was taking an English as a Second Language class from an instructor from Los Angeles City College. They practiced vocabulary amidst some foldout tables, a low-hanging chandelier, some intricate curlicue molding on the ceiling, and, embossed on the walls, residual imprints of the funeral parlor. The union also offers computer literacy classes, citizenship classes, nutrition classes, a green janitor education program that teaches people how to clean in ways that produce less waste, and financial literacy classes. The union’s emphasis on financial literacy, and its support of cundinas, is designed to counter payday lenders that are all too prevalent today, especially in poorer parts of Los Angeles. Dr. Steven Graves, a professor of geography at California State University, Northridge, has mapped the prevalence of payday lenders across L.A. Low-income areas with a high percentage of African American and Latino residents have many more payday lenders than other neighborhoods. Graves has mapped 50 payday lenders just in South Los Angeles. The long-term consequences of the quick cash offered by these lenders can be severe. According to the Center for American Progress, one in five title loan borrowers will lose their car, one in four online payday loan borrowers’ bank accounts will close, and four out of five borrowers will need to borrow multiple times just to stay afloat. Nynor Galindo, a now-retired janitor, participates in the cundina in part because there are no fees or interest payments. In response to every point made during the cundina gathering, Galindo would chime in, “And zero interest!” With the cundina, he and his partner Ana Velasquez were able to pay off all of their credit card debt 18 months earlier than expected and avoid high interest payments. The collaborative nature of the cundina can make the difference. Estrada said when his family had an emergency in Guatemala, he was able to switch numbers with a friend in the cundina so he could collect his money in an earlier month and send it to his relatives. Now with the help of the union’s cundina and financial literacy courses, Estrada is thinking far beyond payday—he’s saving up so he can buy a piece of property back home in Guatemala. Melissa Chadburn is a fellow with The Economic Hardship Reporting Project and has written for Guernica, Buzzfeed, Poets & Writers, American Public Media’s Marketplace, Al Jazeera America and dozens of other places. Her essay, “The Throwaways,” received notable mention in Best American Essays and Best American Nonrequired Reading. Her debut novel, A Tiny Upward Shove, is forthcoming with Farrar, Straus and Giroux in Spring of 2017. *Photos courtesy of Melissa Chadburn.